Your brand is what your customers experience first about your business. It is the most important prerequisite for your success. To get the right reaction, you must make the right impression. A fresh and unique logo grabs the customers attention and compels them to take an interest in your product. 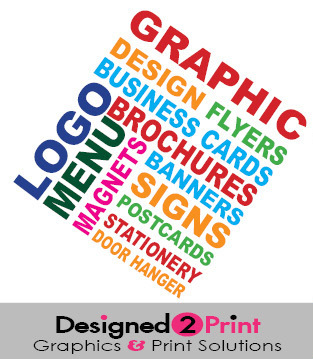 At Designed2Print we work closely with you to match your budget, business objectives and create unique and original logos. If you desire a fresh look to an old profile, or need to create your market identity from scratch, we can help you make a lasting impression. T: (954) 801-0285 E: info@designed2print.net © 2019 designed2print. All rights reserved.